How do you arrange the books on your shelves? Do you organise alphabetically by author? By colour of the spine? Do you separate out your TBR pile from the main library? On my shelves, the unread books rub shoulders happily alongside those that I have read, and instead I organise them thematically by vague genre. The fantasy books occupy two bookshelves, the historical fiction another (arranged chronologically of course), and the Viragos are stacked up in one teetering pile down the side of one of the bookcases as I’m swiftly running out of room to accommodate them. Never have I been more grateful for this system of organisation than when I was ill recently and longing for a comfort read which would entertain me without taxing my brain. Right there next to Miss Pettigrew Lives for a Day by Winifred Watson (one of my favourite books from last year) was a dusty copy of The Nutmeg Tree by Margery Sharp. Sharp isn’t an author that I know much about because she seems, entirely undeservedly, to have fallen into obscurity. Although a prolific writer of novels for adults, she is mostly remembered for her children’s books about the two mice called Bernard and Miss Bianca, better known as The Rescuers, and this is probably largely due to the popular Disney adaptations rather than the books themselves. 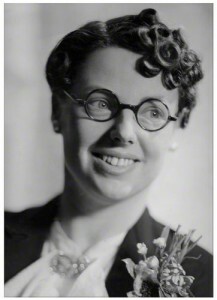 Of all the twenty-six adult books that she wrote only The Eye of Love, published by Virago in 2004, is currently in print. 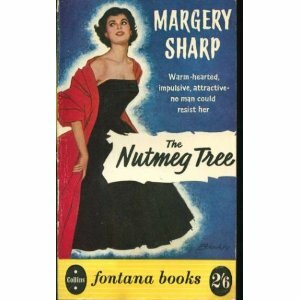 This is a huge shame as, if The Nutmeg Tree is anything to go by, Margery Sharp writes exactly the sort of book I love to read: warm, amusing stories with entertaining characters, written with a light touch and a wry, humorous tone. I’m picking them up in second hand book shops whenever I see them, but some of them (particularly the intriguingly titled Rhododendron Pie) are rarer than hen’s teeth. Hopefully I’ll get hold of a copy one day. The Nutmeg Tree charts the fortunes of Julia, a middle aged former actress who retains her gleeful love of life and all it has to offer. Her enthusiasm and warmth has got her into trouble before in her youth, not least when she finds herself swiftly become pregnant, married and widowed in the space of a few months. Stifled by the kindness of her very proper and rather rich in-laws, she leaves her daughter Susan with them to be raised and returns to life and work in London. At the start of the novel, Julia has not seen her daughter for sixteen years until a letter arrives from Susan enlisting her mother’s help in persuading her grandparents to let her get married. Unable to resist this cry for help, the affectionate Julia immediately boards a boat for France, determined this time to be a proper mother. But old habits die hard and Julia’s exuberance will not be repressed, particularly when there are eligible gentlemen around. Julia, by marriage Mrs Packett, by courtesy Mrs Macdermot, lay in her bath singing the Marseillaise. Her fine robust contralto, however, was less resonant than usual; for on this particular summer morning the bathroom, in addition to the ordinary fittings, contained a lacquer coffee table, seven hatboxes, half a dinner service, a small grandfather clock, all Julia’s clothes, a single-bed mattress, thirty-five novelettes, three suitcases, and a copy of a Landseer stag. The customary echo was therefore lacking; and if the ceiling now and then trembled, it was not because of Julia’s song, but because the men from the Bayswater Hire Furniture Company had not yet finished removing the hired furniture. Julia is such a character it is impossible not to like her and enjoy reading about her exploits as she tries to appear respectable for the sake of her daughter. If just given the facts about her, she should be someone of whom the reader disapproves: she is far too free with her affections and abandons her young child out of boredom and frustration. Yet Sharp creates her in such a way that her great ability to give love suggests bounty and generosity rather than being a negative attribute, and there is no judgement at all on her decision to leave Susan with the Packetts. If anything, the reader is encouraged to sympathise with Julia’s feelings of being stifled and bored among her interfering but well-meaning in-laws. Her escapades never fail to entertain and bring a smile to my face. The story itself isn’t exactly full of surprises; you can tell from the tone of the writing that everything will work out for the best. Sometimes however, the journey is far more important than the destination, and I’ll happily travel along with Julia any day. Sir William talks about feeling a mixture of affection and amusement towards Julia, and that’s exactly how I felt towards The Nutmeg Tree. I really hope that I keep finding her books in the second hand book shops of Charing Cross Road, but more than that I hope that she is rediscovered and reissued so that more people can enjoy her work. With her humour, intelligence and charm she seems like prime Persephone material to me. The Nutmeg Tree by Margery Sharp. Published by Collins, 1948, pp. 252. Originally published in 1937. The eye of love has been on my library wishlist for a while now and I’d forgotten that I put it there because it is a VMC! I could do with some comfort reading, so I have ordered that up, and then maybe I’ll give the Nutmeg tree a go too. Look out for the post on my Virago Venture blog! I hope Margery Sharp hits the spot for you as she did for me. I look forward to your reivew! Try “The Flowering Thorn” if you can get hold of it. I wish someone would reprint all her novels. I discover this writer when I first ventured into the “Adult ” section of the public library , sometime in the early sixties and I still buy any copies of her novels I find in second hand book shops but the supply is drying up .